I have built a pedal expecting a +/- 12-15V symmetrical power supply. 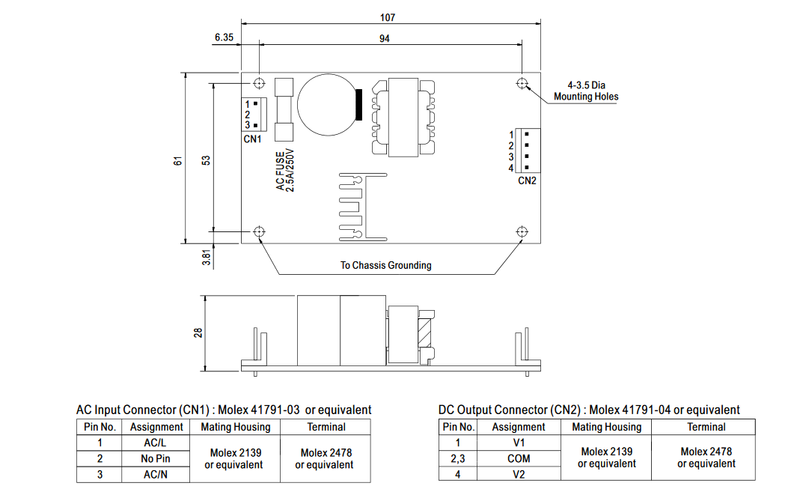 I am torn between two solutions : either use a 15V Meanwell PD2515PSU i have on a shelf, or modify a Tube Driver daughter board to feed my stompbox symmetrical 12V from a "normal" 12V adapter. 1 - I have no experience from wiring Meanwell PSU, so could anyone help me and tell how to wire it properly to the pedal ? On the CN2, where is the +15, the -15 and the ground ? I have read that in such circuit (i'm referring to the 12V daughter board on vero), the ground is "shared by the input and the output" : does this mean that i should wire both the DC ground and the circuit ground to the single hole at the bottom right of the veroboard ? snk wrote: I have read that in such circuit (i'm referring to the 12V daughter board on vero), the ground is "shared by the input and the output" : does this mean that i should wire both the DC ground and the circuit ground to the single hole at the bottom right of the veroboard ? Yes. All grounds are connected together. Thank you for your answer (and thank you as well for your website http://mirosol.kapsi.fi/ and your many contributions on tagboardeffects) ! It uses 9VAC (not DC) and converts it to +/-15VDC with a whole lot fewer parts than that Meanwell supply. Plus, it's not switch-mode, so no risk of heterodyning or anything if there are clocks in the circuit.